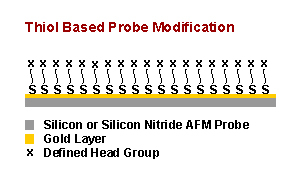 Modified surfaces are comprised primarily of either thiol-based or silane-based self assembled monolayers (SAMs). Thiol modified surfaces, available with CH3, COOH, OH and succinimde end groups, are attached via chemical apsorption to a freshly applied layer of gold. Alternatively, silane monolayers, including APTES, are tethered to oxide layers on the surface of either glass or mica substrates. 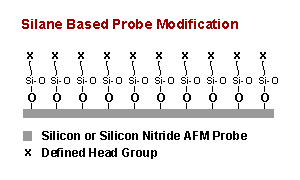 Further modifications can yield a variety of surface chemistries including NH3, maleimide, biotin, streptavidin, neutravidin, antibodies, PEG linkers and a number of other molecules. Standard mica surfaces are 1cm x 1cm although custom sizing is available. Glass surfaces are 12mm round pieces, however other sizes may also be available. Be sure to mention custom requirements when inquiring. As is always the case at Novascan, we welcome the opportunity to discuss custom modifications including custom particle attachment or chemical modifications.